It’s a very happy Friday here in sunny Melbourne! I am delighted to say that the sun is shining and we are preparing for a long weekend to celebrate the Melbourne Cup. It is true ….a horse race stops the nation. A weekend of barbeques, champagne, racing attire and finishes. I am delighted to have finished some more cushions for my beautiful friend….six completed …two more to go! 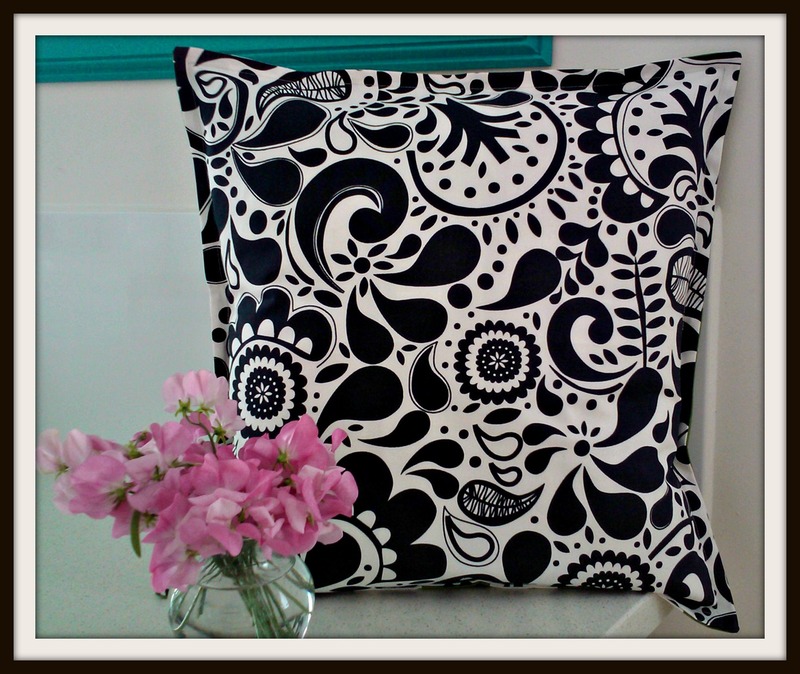 This cushion is a black and white paisley pattern fabric -20 x20 inch square with a 1/2inch border. The fabric is home décor weight and comes from Ikea. I made a mix of Paisley and Spotty cushions. The backing fabrics are a mix of green and orange strips. You can see a little of the orange strip in this pic. I am pleased that they have turned out well. Always nice when you are happy with your sewing!!! 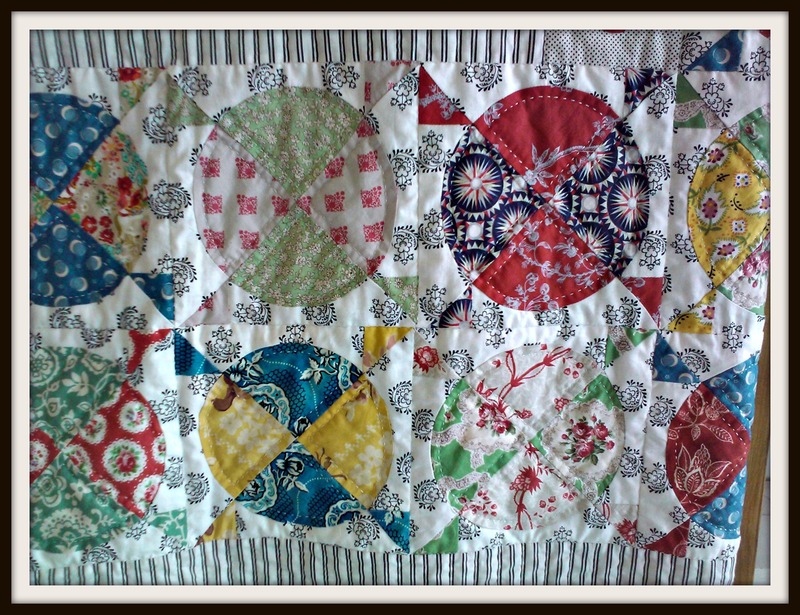 On another note…..I just love Medallion Quilts…..do You? I especially loooove… this one ……The French Market Medallion! This quilt is amazingly beautiful. French Market Medallion was designed by the lovely Judy Newman @ A Very Fine House. I was lucky enough to be at Amitie Textiles, where Judy teaches, to see the quilt in real life and purchase the pattern. It is a quilt that is just so endearing. The closer you look at it the more you see….. I just love the appliqued vase and the beautiful little appliqued birds on the corner of the border. The border is just so effective with a clever use of fabric. The following borders of circles are simply exquisite; with a myriad of beautiful fabrics and gorgeous little pinwheels dividing up the circles. I can’t wait to make this quilt. 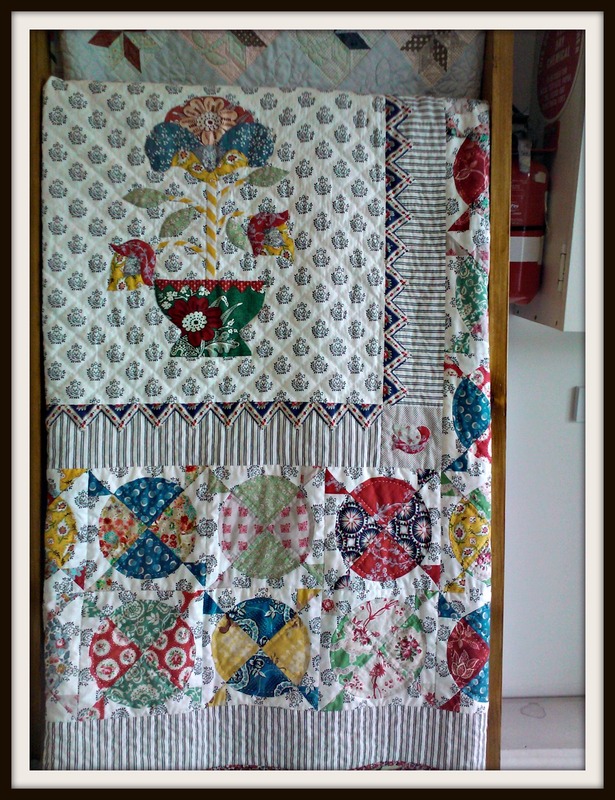 If you love this beautiful French Medallion quilt then go check out Judy’s pattern @ A Very Fine House here! I am supporting the linky parties – NTT @ My Quilt Infatuation, Thursday Thread @ 627 Handworks, Whoop Whoop @Confessions of a Fabric Addict, TGIFF @ Quilt Matters and Finish It Up Friday @ Crazy Mom Quilts. Stop by these wonderful blogs to check out all the lovely projects and/or link up and support them. Wherever you are in the world…….have a fabulous weekend. As always, thank you for stopping by! Love the cushions you are making for your friend. 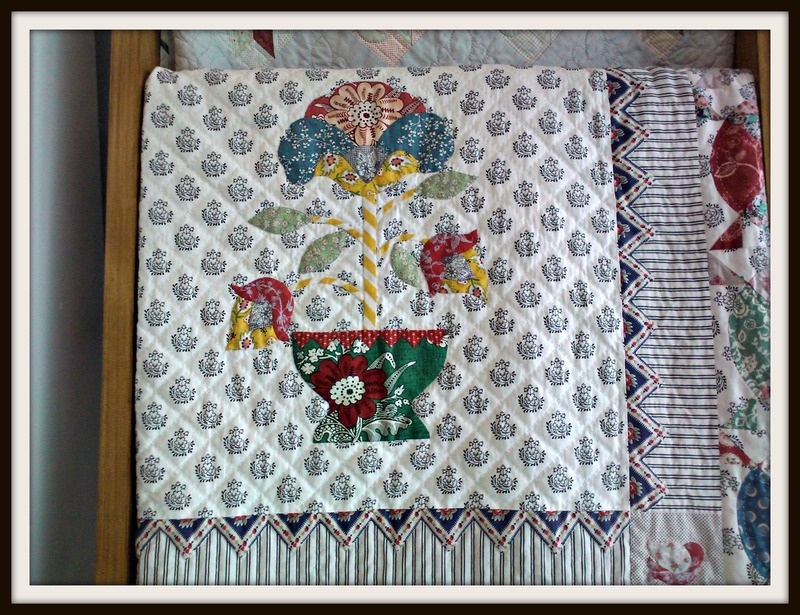 That is a beautiful quilt, and I agree – great use of fabrics. I have some home dec sewing to do for a friend, soon, too, and I appreciate seeing your cushions. (Truthfully I am feeling a little cranky about sewing corded cushion covers and throw pillows, even though I offered to do it.) The theme of my day is attitude adjustment, so seeing your lovely pillows has adjusted my attitude again 🙂 Thanks! I love Amitie Textiles. So much loveliness! And those cushion covers are so cheerful and fun! Love! love the ikea fabric, did not see it at our Ikea here in the UK when I went last week, the fabrics all had enormous patterns on them. Enjoy Melbourne cup weekend, seem to remember when I was living in Melbourne I went to Sydney that weekend, going back to 1970!! 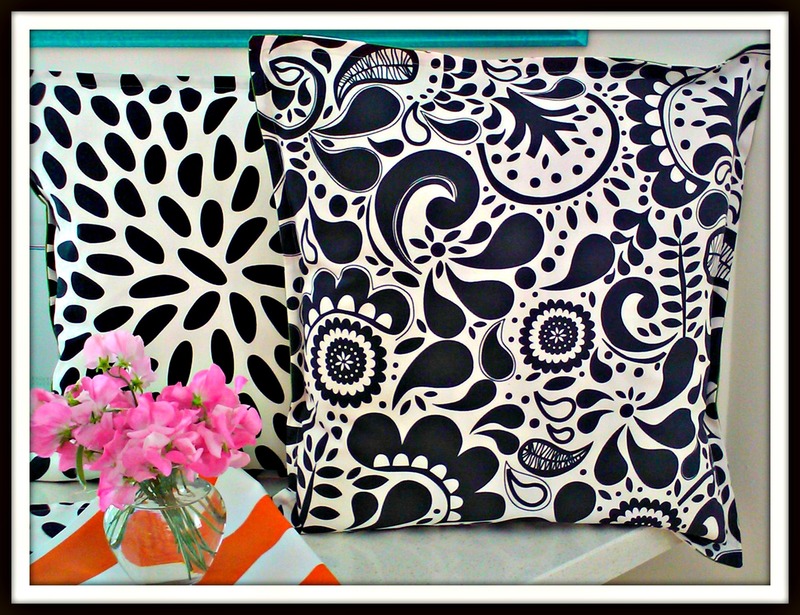 The cushions are very elegant and so crisp in black and white! I will look forward to seeing your version of the medallion quilt. I love your pillows— they are so much fun to make and the fabrics are beautiful. Thanks for sharing that quilt as well! Lovely!!! ooh! LOVE that French Market medallion. those fabrics are YUM! and love your pillows too! I have been admiring Judy’s new pattern too! But I must really finish my Museum Medallion first (another of Judy’s patterns!) Is this one all hand pieced too? Ooh, great cushions. Love the bold black and white fabric! Thanks for linking up with TGIFF! Fabulous cushions, Marie. I love the graphic prints and the idea of orange and green stripes on the back. Oh yes, that French Medallion quilt is one you could look at all day and still find fascinating. I can imagine how excited you are to make one! Love, love those circles on the border! Those black and white pillows are pretty awesome too!